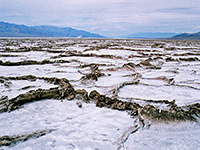 The low, salty pool at Badwater, just beside the main park road 18 miles south of Furnace Creek, is probably the best known and most visited place in Death Valley. The actual lowest point (-282 feet) is located several miles from the road and is not easily accessible - in fact its position varies, but a sign in front of the pool proclaims it too to have an elevation of -282 feet, and it is here that everyone comes to take photographs. An enlarged parking area and other new facilities were constructed in fall 2003 to cope with the ever increasing visitor numbers at the site. 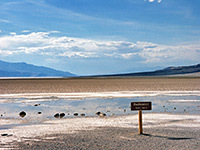 There is not much else at the Badwater viewpoint apart from an orientation table, identifying many of the surrounding mountains. High in the rocky cliffs above the road, another sign reads 'SEA LEVEL', giving a good indication of just how low the land is. Far above this, the overlook at Dante's Peak has imposing views over Badwater and the surrounding desert. Several salt trails and shallow seasonal streams lead towards other pools out across the valley. During occasional rainy periods, a large shallow lake forms, several miles across and only a few inches deep, but most of the water soon evaporates or sinks below ground. Badwater never dries out completely, and even manages to support a unique species of fish - the Death Valley pupfish, a small bluish creature which has evolved to survive in the hot saline conditions. South of the salt pools, the seasonal Amargosa River meanders for 30 miles via several routes towards the mouth of the valley, before sinking into the sand. 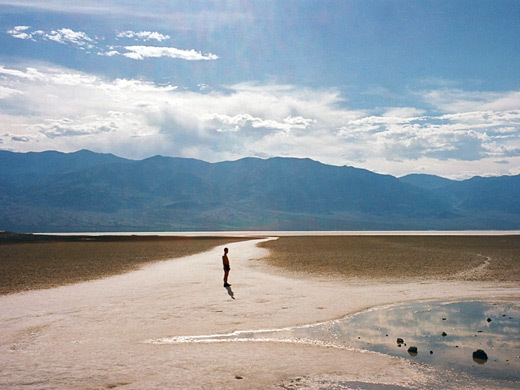 Apart from the extreme temperatures that prevail most of the year at Badwater, one unusual feeling when walking around is the heaviness of the air, augmented by the localized humidity from evaporation of the salty water - all movement seems more laboured and difficult than usual. The shade temperature is often above 120°F, yet at such times it is an unforgettable experience to wander a little way out onto the salt flats, and just stand for a while in the stifling heat.